Hello, I’m Stephanie and I find it hard to rest and relax. I have had a headache since Saturday. I know that many people suffer from migraines, I’m not one of them. After being in the ER Saturday, I know this isn’t one either. Anyway, we are on day 4 of having the headache. Yesterday I put myself on the schedule to work. Although, about half an hour after taking my son to school, the pain skyrocketed. I took myself off the schedule and laid in bed most of the day. I felt guilty for not working, cried in my husband’s arms when he arrived home. Feeling sick and helpless isn’t a feeling I am very familiar with. Today, is a snow day for the little. That means I get to stay home and rest. Which means, God knows what I need. He knows I have a hard time giving it to myself. Today, I don’t need to decide on the PTA meeting and work. It’s been decided for me, REST. 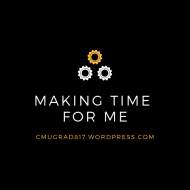 Making Time For Me, Create a free website or blog at WordPress.com.